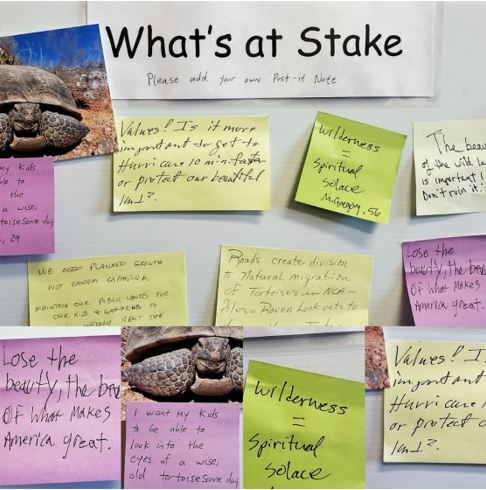 Local residents engaged with Conserve Southwest Utah’s grassroots transportation alternatives, providing valuable feedback that will help our county solve its transportation challenges. Visitors to CSU’s booth engaged in nitty-gritty conversations about road alignments and traffic levels, but also shared inspiring stories about the value of our public lands for present and future generations. We thank all who commented on our grassroots alternatives and those who provided new alternatives to consider. Your feedback proved useful in understanding our community’s desire to protect open space and public lands, the eagerness of people to embrace multi-modal and active transportation, and the transportation alternatives people would most like to see analyzed in a technical review. 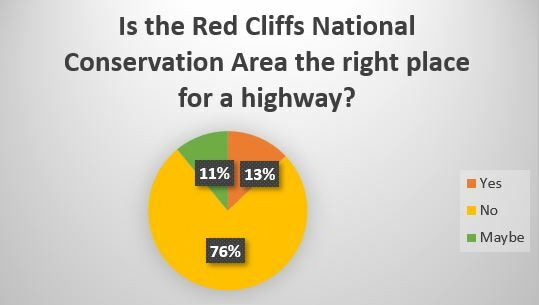 Over three-quarters of respondents don’t believe that the federally-protected Red Cliffs NCA is the right place to build a highway. Those in favor of the Northern Corridor lamented that the highway is a necessary evil for keeping up with rapid growth. CSU will continue working to educate our community about Vision Dixie Smart Growth principles (click the link to read more) and their connection to reducing traffic. Implementing Vision Dixie principles in each city would allow our larger community to shape growth (instead of just accommodate it) in a way that protects public lands and quality of life. Rapid growth was a hot topic at the Transportation Expo. 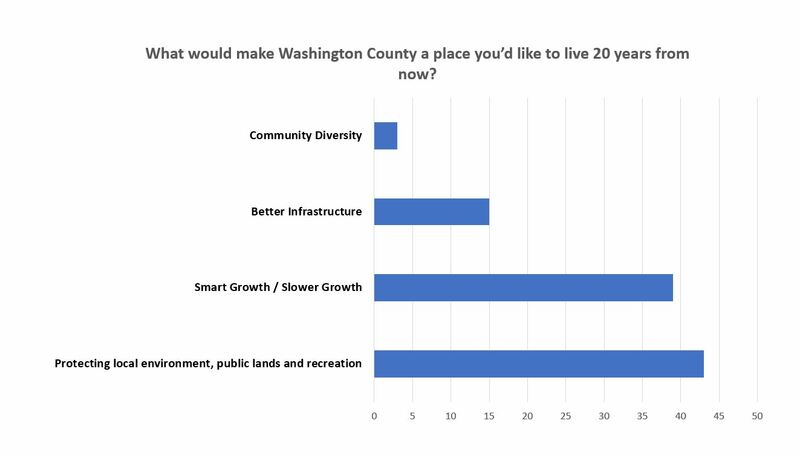 Nearly 40% of respondents said that slower, more controlled growth is what would make Washington County a place they’d like to live in the future. The University of Utah’s Kem C. Gardner Institute projects that Washington County’s population will grow to 500,000 residents in 2065. Projections like these are not self-fulfilling prophecies, but we do need to prepare for increased traffic congestion. Reducing individual vehicle trips is a reasonable goal for most residents, but one that will require a paradigm shift that embraces alternate forms of transit. This is one area where CSU and the Dixie Metropolitan Planning Organization (DMPO) agree! 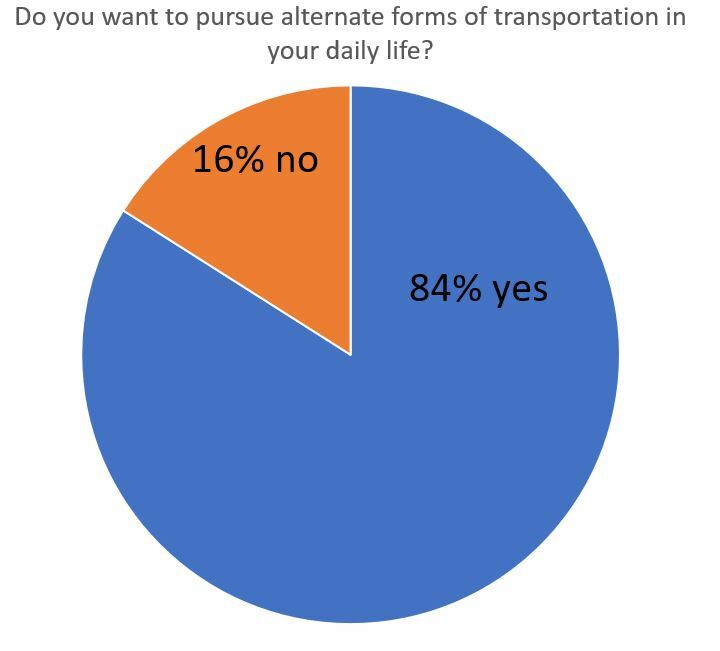 The vast majority of respondents said they’d like to get out of their personal vehicles to meet daily transit needs. 15% of respondents were curious about using public transit, but worried about speed, convenience, and the ability to take “stuff” on the bus. SunTrans, our local bus service, has 6 routes, 134 bus stops, front-loading racks for bicycles and is a quick and cost-efficient way of getting around town. In the future, CSU will make a point of providing outreach on SunTrans service and updates on improvements to routes, timing and capacity. Stay tuned for bus stories! The county claims that increasing east-west traffic is driving the need for the proposed Northern Corridor. 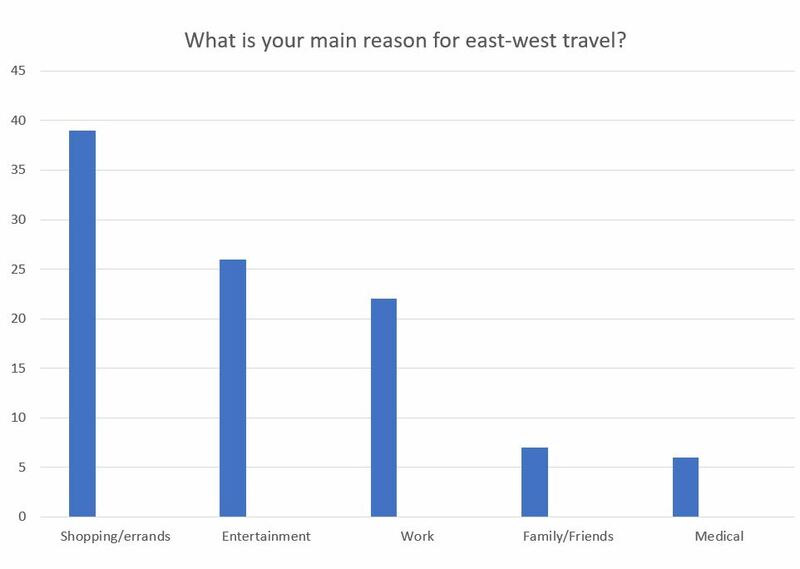 We asked respondents how frequently their travels take them from east to west, for what purposes, and what routes they use most often. 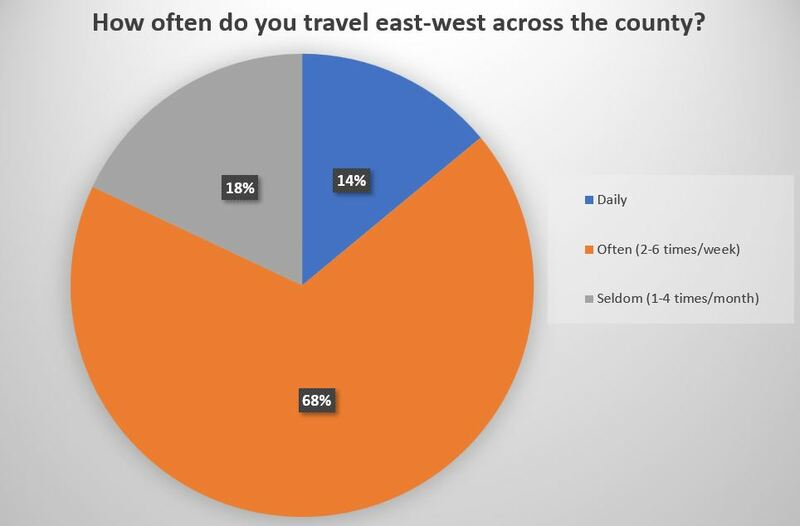 82% of respondents said that they travel east-west across the county daily or frequently. The number one reason for daily and frequent east-west travel? Shopping and errands. Large numbers of people traveling to Costco and Walmart after work and on the weekends increases pressure on St. George Blvd. Exit 8 and Green Springs Exit 10. A more porous I-15 would allow cars to travel back and forth across I-15 without needing to use these exits. Additionally, implementing Vision Dixie Smart Growth Principles would help current and future residents enjoy the benefits of walkable, mixed-use communities. Red Hills Parkway was the most commonly used route for east-west travel, followed by St. George Boulevard and Dixie Drive. 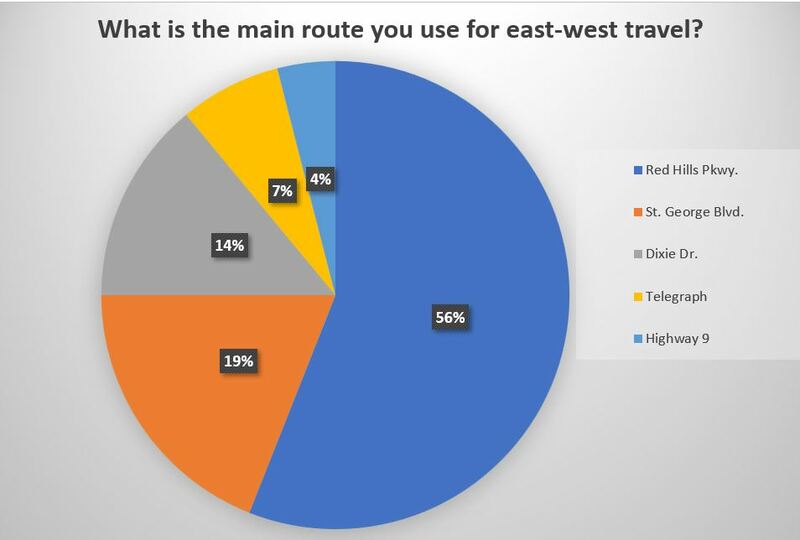 Only 4% of respondents said that they use Highway 9 for east-west travel. Those using Highway 9 would be traveling from the Hurricane area to St. George or vice versa. Our survey data contradicts what the county claims is driving the need for the Northern Corridor: frequent east-west travel between Hurricane and Santa Clara/Ivins. Analysis of the Dixie Metropolitan Planning Organization (DMPO’s) transportation model can prove whether this need really exists. 46% of respondents said they liked the Red Hills Parkway Flyovers best. The DMPO has considered this alternative in the past, but claims that the Northern Corridor is cheaper. Estimated at $110 million dollars, the Northern Corridor is not cheap and would have a severe cost on our environment and community. 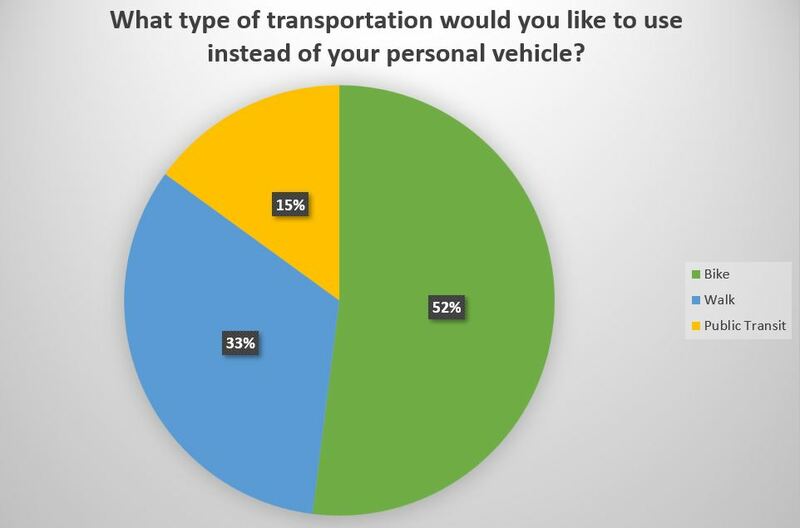 31% percent of respondents said that multimodal transportation, including bus service, is the transportation alternative they liked best. 22% best liked “other” alternatives offered by CSU. These include a more “porous” I-15 (more over and underpasses at spots like 400 East or 2450 East); rerouting truck and through-traffic on the Southern Parkway; and efficient intersections that don’t require vehicles to make a hard stop when turning right or left. 1% of respondents recommended upgrading and improving existing roads. 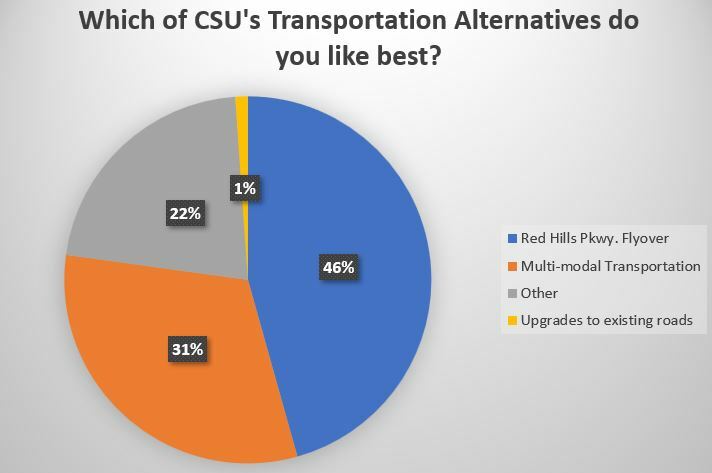 One respondent offered CSU a great new transportation alternative to consider: improving Red Hills Parkway with a dedicated turn lane throughout and flyovers at the new mall underpass, 10th east, and Green Springs. 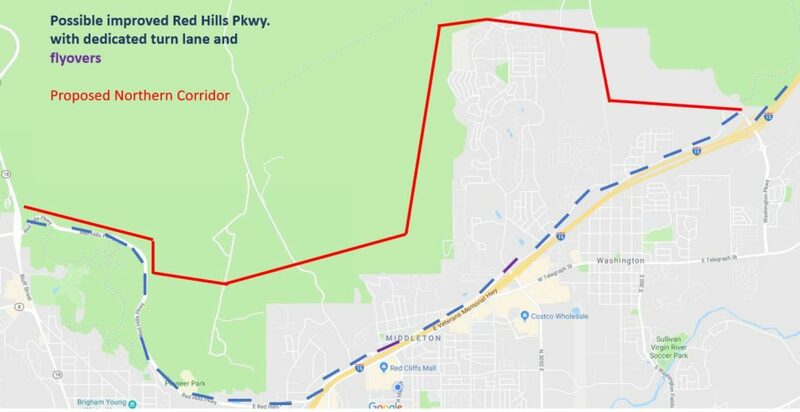 These upgrades would enable Red Hills Parkway to function as a primary east-west corridor from SR-18 all the way to its junction with I-15 Exit 13. This is a shorter, faster more direct east-west route that would protect the Red Cliffs NCA. CSU continues to advocate that ideas like these are worthy of fair analysis. Conserve Southwest Utah continues to seek a technical review of the DMPO’s transportation model, including the Northern Corridor, Potential Alternatives, and Cost Analysis. This is one of our important “next steps.” Please return to the newsletter to read about others!